Caribou Coffee is celebrating the first day of spring! Today, March 20th only, they’re offering B1G1 FREE Drinks! To get your buy one get one FREE drinks, just show the cashier this coupon on your mobile phone. You can also print it out and give it to them. Your lower priced beverage will be FREE, so try to get two beverages close to the same price to maximize your coupon. What drink will you be ordering today? 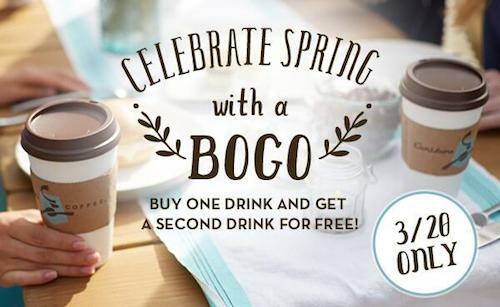 Valid at participating Caribou Coffee stores on March 20th, 2014 only. Discount will be applied to lower priced beverage. Not valid on bottled beverages. Must show coupon on mobile device or have printed at time of transaction to receive offer. One offer per person.